Will and I combined our expertise in precision torsion pendulums and one-nucleon transfer reactions to create an epic McBride Range ski traverse. He trusted me with planning the trip, since I'm more familiar with the mountains around these parts. Here's how I used my expertise. 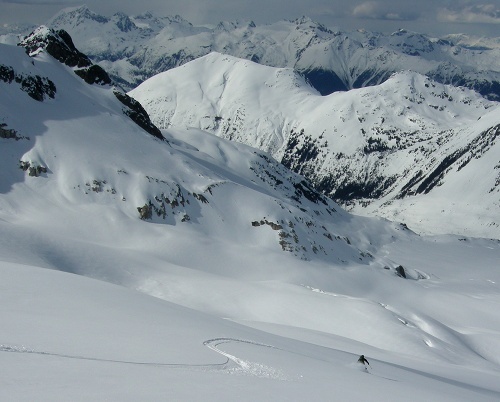 I deemed it necessary to ski all the best big descents along the way and further assumed that all unknown terrain would prove easy to navigate. Bwahaha. It seems better to start at Rubble Creek and exit Singing Pass Trail to Whistler, so that we could readily find cold beer, hot food and a possible return ride to the trailhead on the far side. We are originally going to head up 99 Thursday night, but Will is delayed by a thermistor. I have no idea what particular device gives him grief, but I can vouch from experience that Pt100 resistors are delicate little babies. We finally leave the Rubble Creek parking lot for Garibaldi Lake at 3:45 pm on Friday. Stopping to change from shoes to skis 5 km up the trial, Will realizes that he has forgotten his gloves and hat. An extra 10 km to get the trip started, 'atta boy! Due to the compounded delays, we spend Friday night at the Burton Hut. We have it to ourselves, which is quite nice. 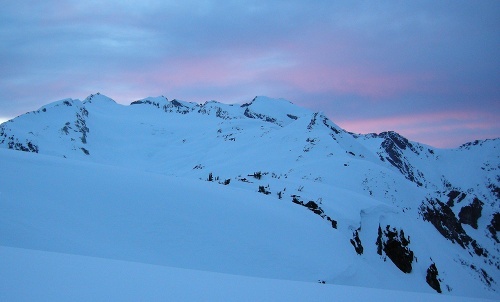 Given an early start from the Burton Hut, I can't resist the East Face of Carr. We leave the hut around a quarter to 7 Saturday morning. Will skins up the Sphinx Glacier with the The Bookworms, Sphinx, and Mt Garibaldi in the background. Rain or shine, this mountain gets me wet. 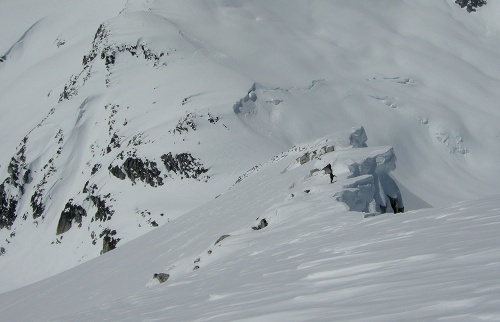 Will hits the summit ridge of Mt Carr. 1118 m above the hut, it's time to harvest 640 m of pure fall line down the East Face of Carr. Our packs are as heavy as they could be, laden with food and gear for two arduous days. So what could be more appropriate than a 60 degree slope with buttery corn snow from the summit? The perfect warmup run! Sky is now officially loving life. On the next roll below the summit block, Will seems to like it too. But he didn't stop to chat about it. Next we're going to climb 513 m up Parapet Peak. Will skins along the summit ridge of Parapet next to those huge cornices. 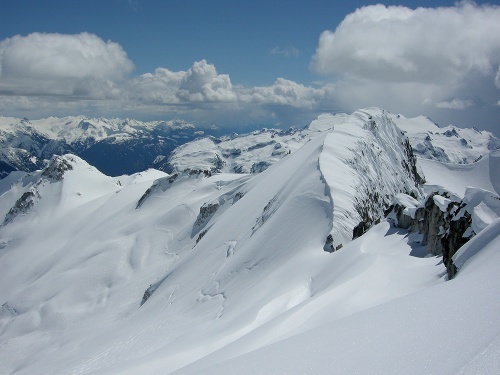 Isosceles Peak and its Northeast Face are so irresistible from the summit of Parapet Peak. The plan is to descend east from the summit of Parapet to put ourselves in position to kick steps up the Northeast Face of Isosceles. A couple hundred meters of good turns and traversing lead to a couple hundred meters of powder snow that is, to my relief, neither too deep nor too sloppy. 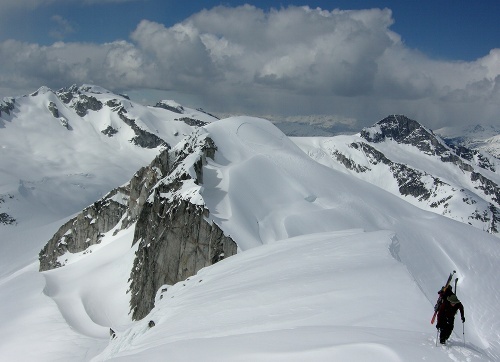 At the top I'm positively salivating to ski 750 m of bliss to the eastern edge of the flats on the Isosceles Glacier. 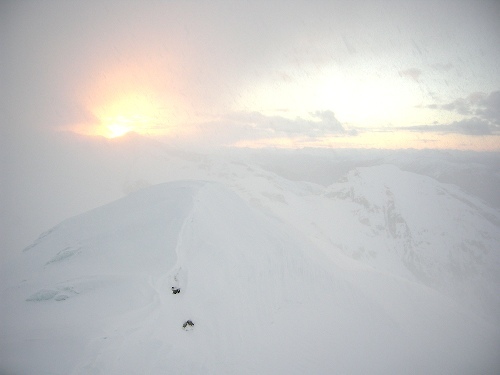 Will walks along the summit ridge of Isosceles Peak. 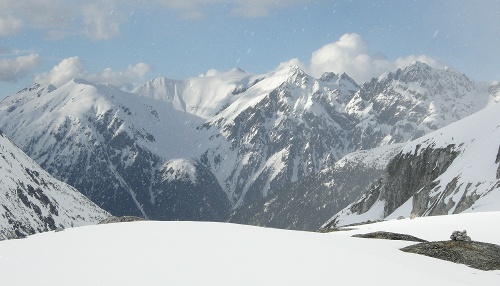 The East Face of Mt Carr is in the distance on the left. Parapet Peak is rocking the crown in the near background. Mt Davidson is visible in the distance on the right. Steep powder? We'll take it. 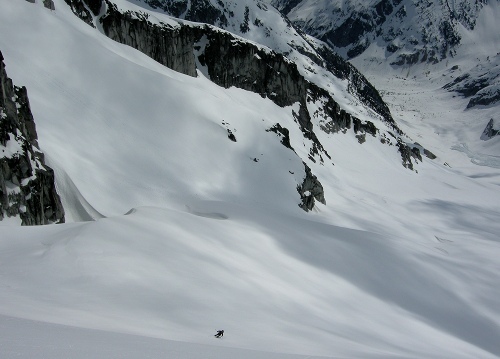 Will contemplates the shape of things to come on the flats of the Isosceles Glacier. 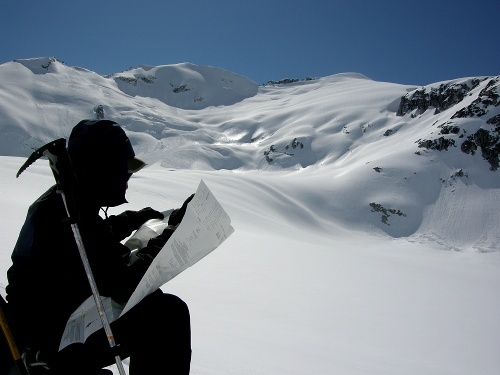 The corner of the map points directly at the summit of Isosceles. Now how far can we get today? I feel rather refreshed after our long break to melt snow on the glacier. It's only 250 m or so to the ridge. Then comes a treacherous 400 m descent to Drop Pass. 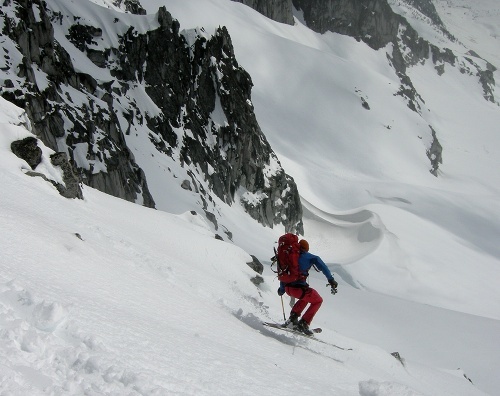 The snow is quite rotten on this eastern aspect and the crevasses are hungry, tickling the tails of our skis. 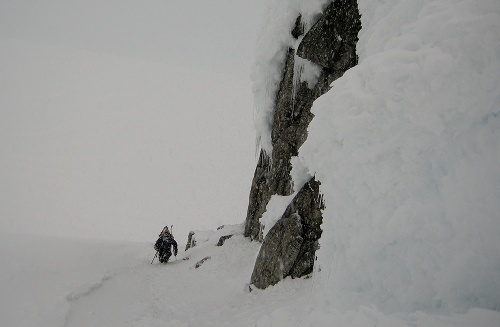 In a snow squall at Drop Pass, we both resolve to ski the 763 m to the summit of Forger posthaste. I do recall telling Will that it would only be 700 m, but he's not the type to be bothered with such trifling details. A view across the Cheakamus to the peaks above Whistler. Getting closer? It's getting rather late near the top of Forger. And this pesky snow squall just won't lift! I'm beginning to panic on the summit. The sun is setting. I don't have anything to wear other than a t-shirt and a softshell jacket. Then the clouds break. Sunset over Davidson from the summit ridge of Forger. 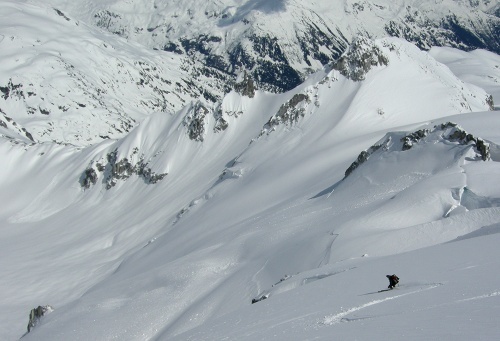 Not only can we see where to ski on the glacier, we get to make our turns in light fluffy powder! "Suffer during the day or suffer during the night." 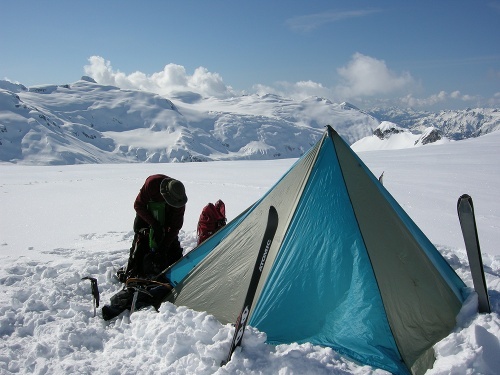 We ski 336 m of powder, climb to the col between Forger Glacier and Snow Bowl Glacier, and make camp. Then we suffer. The whisky I brought helps, but the bottle's empty all too soon. There will be no early start, but camp at the col sure is nice in the morning sunshine. Will skis from the col with Forger looming behind him. 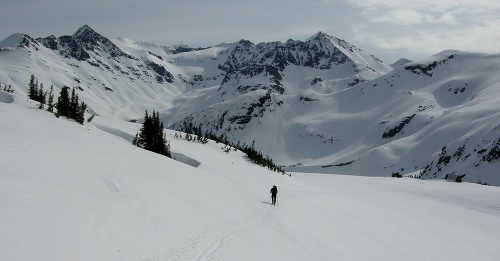 A toasty 225 m warmup climb rewards us with a view of Mt Sir Richard, today's lofty goal. 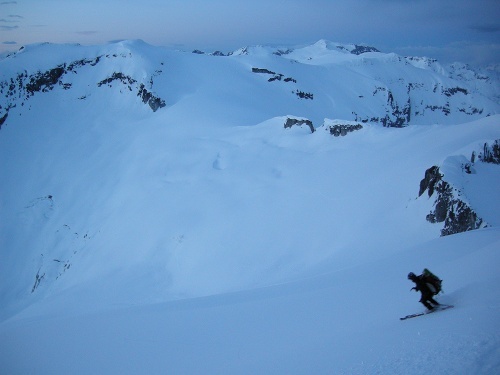 We quickly descend and traverse powder on the Snow Bowl Glacier, climb gradually around a corner, then descend 300 m to a 1900 m col below The Gatekeeper. The Gatekeeper? Let's stop to mention the adventurous nature of low resolution Canadian Topographic Maps. 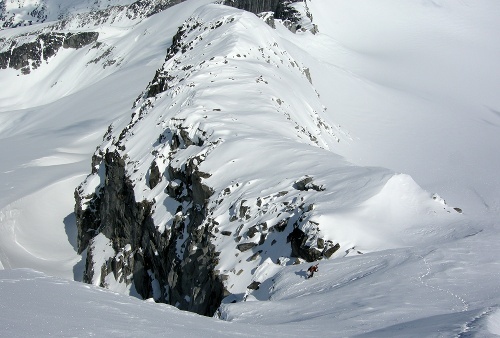 40 m contours hide cliffs that are smaller than 40 m, which are big relative to a person. We follow some old steps up The Gatekeeper before we realize that we need to take another way to Mount Sir Richard. The good news? 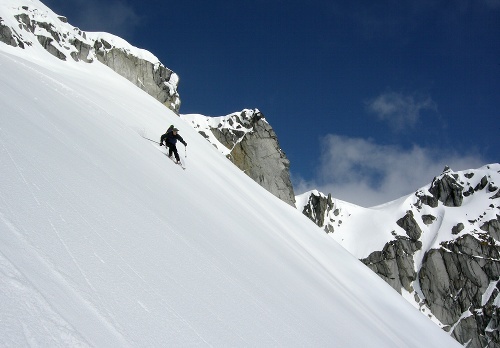 We get to ski 300 m of steep, creamy corn snow. 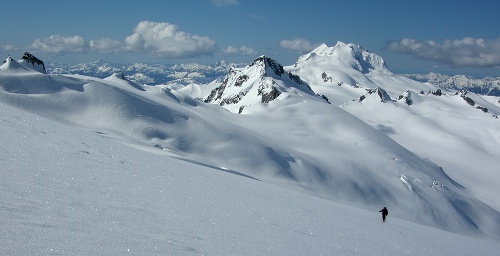 Rectified and rerouted, Will skis toward the summit of Mount Sir Richard high on the UBC Glacier. We've skied pretty much everything you can see in the background. Even the clouds and the Howe Sound. I'm positively alarmed how far it is to Mt Macbeth and, by extension, Whistler. Nevertheless we get a nice brief dose of blissful amnesia with a 1200 m descent down the McBride Glacier. Perfect powder transitions to perfect spring snow. Yesssss. Will likes to ski powder day after day in the month of May. 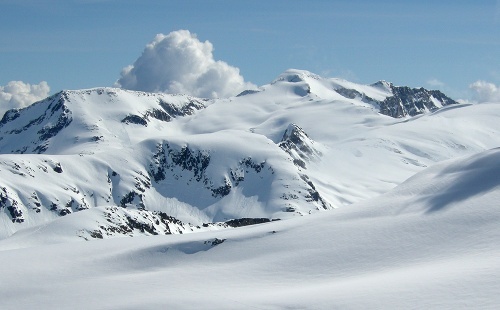 The McBride Range. Bride implies commitment? At least the McBride has a powder dowry. Wedge Mountain is the beast in the distance. Below the McBride Glacier, at the headwaters of the Cheakamus, we take a break. I make some mashed potatoes. Comfort food is good, because I'm not comfortable with our position, given that it's past 5 pm. We contemplate taking a low route. 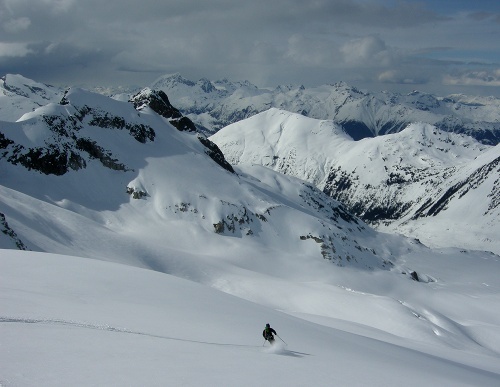 Instead we traverse south-facing slopes toward Naden Pass. The initial ascent from the valley is on nasty isothermal snow; Will and I feel like we're in Washington; I contemplate death in a climax avalanche. Once above the trees again, the slopes have begun to refreeze and conditions couldn't be better to traverse quickly. Near Naden Pass, the last embers of a dying day glow above Mt Macbeth. After trying to get there, I would call it "No don't" pass instead of Naden Pass. The best way to connect with the Spearhead Traverse looks to be via Iago Lake. I've never been there, but I have a map and a headlamp. 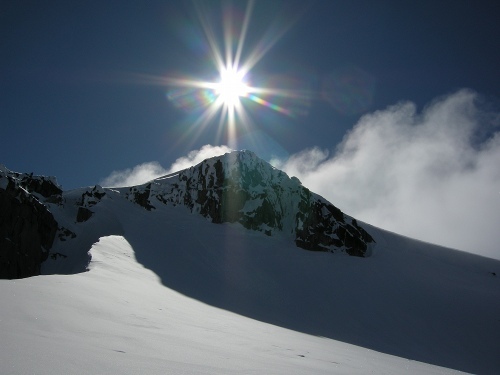 The Spearhead Traverse superhighway is a sight for sore eyes high on the Iago Glacier. Somehow I manage not to freeze in my thin t-shirt. We follow some stupid tracks that lead too high below Fitzsimmons on the Diavolo Glacier. We get another round of powder turns from Benvolio to Overlord. The tracks go low below Overlord, but I stay high and lead us through a round of dodge-the-crevasse-in-the-dark on the Overlord Glacier to get us to Whirlwind-Fissile Col more quickly. The Russet Lake Hut is a huge relief at 4 am. Time for a three-hour nap. Will skis toward Singing Pass from the Russet Lake Hut. Mt Macbeth is in the background. 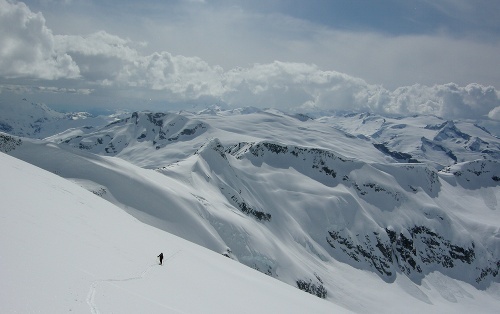 We ski superb spring snow on Cowboy Ridge and Oboe, then descend Singing Pass Trail. Singing Pass Trail is a thing of beauty. So are the waitresses and beer at the Longhorn. Just don't let it get to you when two pitchers of beer cost almost as much as the $55 cab ride to Rubble Creek. Now I'm going to drink some coffee and study halo nuclei until midnight. Who needs sleep? Too bad there's no wilderness up here!!! Tell me about the noodles. Were there any noodles after? No, no noodles, had to rush to the lab for halo nuclei. At least I could warm my hands on the beta radiation. bloody brilliant! way to push on through to the other side. Ha. That is a Sky Sjue style trip. 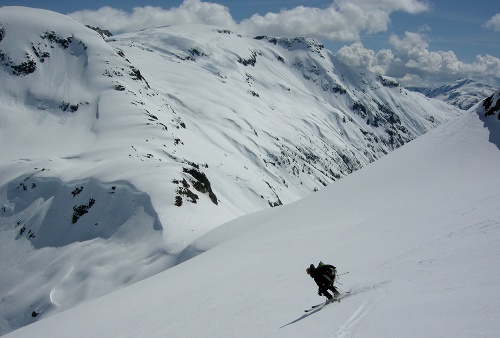 Do you really want to ski with Sky Sjue? Nice one.Looks a lot funner than just traversing the thing in isothermic conditions without climbing peaks.What about Hour Peak. Wow, nice pics and fun story. I can feel like I was along for the ride...without the suffering and drooping eyelids of course, but nevertheless, I am happy to imagine those. Way to rock the McBride Washington style. Speaking of Washington, got a pic of your cumshot couloir. Mike, you guys make speed a style. Now I, there is no style here. I'm hopeless, but I get the job done, somewhat like a horse at plowing a field instead of a fine tractor (which is why I tele with all you rando guys). Sky cringes at my tele antics, but it's my style and I'm sticking to it (for now LOL). Last edited by Jason Hummel on Sat May 15, 2010 9:25 am, edited 1 time in total. Atraslin wrote: Nice one.Looks a lot funner than just traversing the thing in isothermic conditions without climbing peaks.What about Hour Peak. Andy - lets get that one. Although maybe next year? How a few days changes the mountains. I went up on the 12th and 13th. The N face of Parapet's cornice failed and the face is a mess. The powder on the N faces is now non-existent. Isosceles Creek has experienced more than 1 wet slide. Your timing was immaculate. deeluxe trip fellas. i'm sorry i checked in, but not really. noooo! dooon't! I'm a hater and a hater-appreciater, so go ahead and get it off your chest. Tried to call you once or twice. Let's do a big over-the-hill desk-jockey exclusive one of these days. Jason Hummel wrote: Wow, nice pics and fun story. I can feel like I was along for the ride...without the suffering and drooping eyelids of course, but nevertheless, I am happy to imagine those. Way to rock the McBride Washington style. Speaking of Washington, got a pic of your cumshot couloir. I still haven't seen a good pic of the Cumshot from you. If you got it, let's see it, buster. It's only one of the best.